If you are worried that you or a loved one may have a problem or addiction to over the counter medicines, you have come to the right place for help! Addiction Helper have helped over 10,000 individuals seek the correct help, treatment and support for their individual abuse and addiction problems. Any addiction can be life threatening, including addiction to legal drugs such as over the counter medicines. These medicines are easily accessible and some have a great potential to be abused or become addicted to. On this page we tell you all about the most commonly abused over the counter medicines, the signs and symptoms to look out for that would indicate you or your loved one requires professional help, the dangers and risks associated with abuse of over the counter medications, how addiction can develop and the treatment options available. What Are Over-the-Counter (OCT) Medicines? 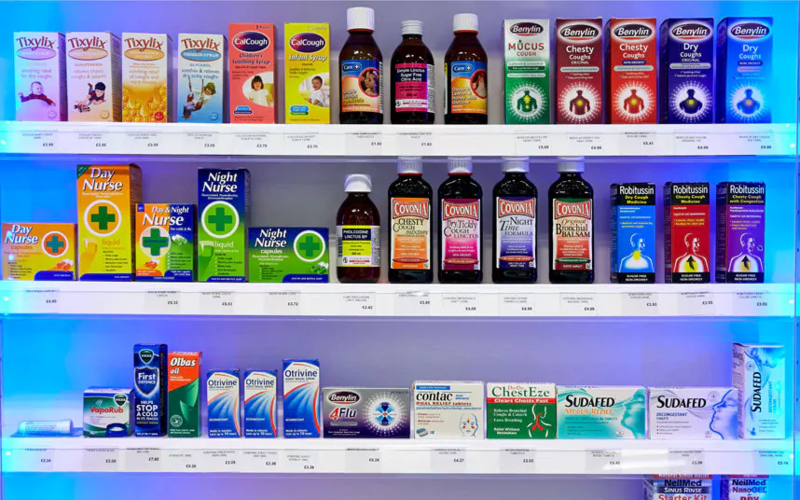 Over the counter medicines are a range of medications that can be purchased legally from any shop or pharmacy. They do not need a prescription. Because they are so freely accessible, it is easy to abuse them and to become addicted to them, without necessarily raising suspicion. 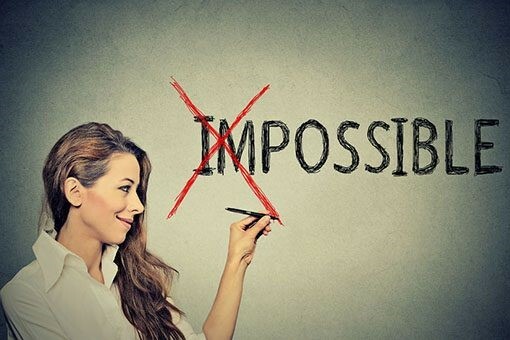 An individual who has an addiction or abuse problem with over the counter medication, will know they have a problem, as they will go to great lengths in order to avoid raising suspicion and being challenged. Pharmaceutical medications can range in addictive properties and strengths. The most commonly abused ones are those that contain Codeine. But there are others also, that have the potential to be abused. Any kind of drug that is being abused, has the potential to develop into a full blown drug addiction and dependency; either psychologically, physically or both. Below are details of the 5 most commonly abused over the counter medicines and their effects and addiction potential. All of these medications contain varying strengths of Codeine in them, from 4mg up to 12.5mg per tablet /sachet. They are all combined with other analgesics such as paracetamol, ibuprofen and aspirin. Many also contain Caffeine and other chemical ingredients. Paracetamol, ibuprofen and aspirin are all extremely dangerous when abused and can lead to drug poisoning, long terms damage to organs, gastrointestinal complications and organ failure. All of these codeine based over the counter medications can cause drug addiction and dependency within as little as 3 days! Dextromethorphan (DMX) – a cough suppressant and expectorant that is included as an active ingredient in many over the counter cough syrups and medicines. When abused creates feelings of euphoria and dissociation from emotions and negative feelings. In large quantities it has also been proved to have hallucinogenic effects. Many antihistamines sold as an over the counter medicine have sedative properties, and are also purchased as a sleeping aid. Taken in high doses, the sedative effects are very pronounced and will make the user feel very sleepy and relaxed. Regular use leads to tolerance building, meaning that the individual will have to take more of the drug in order to gain the same effect… Mixing with alcohol and other sedatives increases the effects of sedation even more. They have a great potential to be abused and become addicted to. Antihistamines are usually sold in syrup or pill form; the active ingredient Promethazine is also used in many other over the counter cough and flu remedies. Decongestant medications are commonly purchased over the counter medications and often contain active ingredients that can be addictive including promethazine. Taken as prescribed they can cause a little drowsiness; when abused and taken in larger doses, they can produce feelings of euphoria, relaxation, warmth and sleepiness. Decongestants, when mixed with alcohol or other drugs, can be potentially lethal, as can overdosing on them. They also have the potential to become addictive due to certain active ingredients. Laxatives are commonly abused by those that have eating disorders, such as anorexia and bulimia. Taken in high quantities (more than the prescribed dosage); this over the counter medicine can be extremely dangerous; leading to severe dehydration, electrolyte imbalances and even death. Those with eating disorders will commonly abuse over the counter laxatives as a way to lose weight or purge from a binge of food. Over dosing and frequent use can lead to all sorts of short term complications and long term damage to the stomach and bowel. Imbalances in electrolytes can lead to problems with the heart, resulting in dangerously low potassium levels that can lead to a heart attack and death. 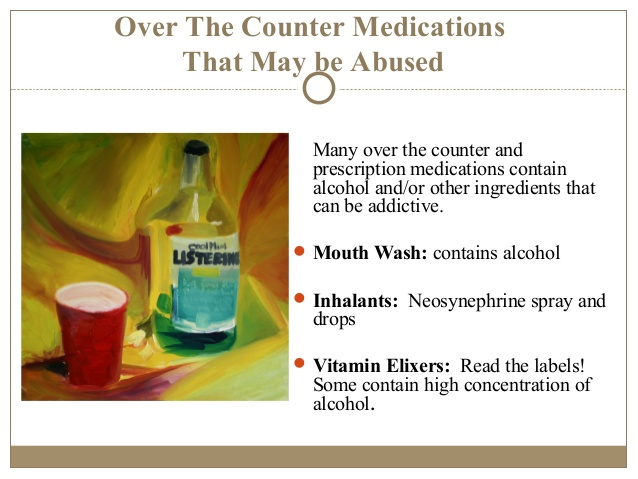 Other over the counter medications that can be abused and lead to addiction are depicted below; they are less commonly abused, but nonetheless there are individuals that abuse them and have developed and addiction as a result. If you are concerned that you or a loved one are abusing or addicted to an over the counter medication, we can assist you in getting the help you need! Call or chat to us live now for a free and comprehensive assessment, so we can best guide you to the correct treatment and support. How Does Addiction to Over the Counter Medicines Develop? Most addictions to over the counter medications start off innocently; with the individual purchasing a medication for a genuine medical complaint. What is most alarming is that most over the counter medications can be administered to children, so addiction can start at a very young age and very innocently. Addiction is a chronic relapsing brain disease as defined by the National Institution on Drug Abuse (NIH) and Public Health England (PHE). Those that abuse over the counter medications, do so for the pleasurable effects and not to treat a genuine illness. Physical dependency can occur when an individual is taking an over the counter medication for longer than recommended on the packaging, this does not necessarily mean they are an addict. Addiction occurs where there is a psychological and physical need for a particular drug. Addiction resides in the brain and the brain’s neurotransmitters and receptors. Addicts’ brains produce lower than normal levels of the happy chemical Dopamine, and so will seek out drugs or activities that stimulate the brain into producing this chemical. Over the counter medications that contain opioids or narcotics such as Codeine, bind to the brain’s opioid receptors and flood the brain with Dopamine, producing feelings of relaxation, euphoria, warmth and sedation. All codeine based over the counter medications now carry a warning relating to the potential of addiction developing. Other over the counter medications that contain active ingredients that can give pleasurable effects work in a similar way for the addict. Some individuals may have a genuine medical complaint and use the product for longer than recommended rather than seeing their doctor; physical dependency can occur this way, but does not necessarily mean that they are an addict. They can usually withdraw by weaning themselves off the product as soon as the medical complaint has been resolved. Addicts will almost certainly not be able to stop on their own, as they are addicted both mentally and physically; they will continue to use and abuse the over the counter medicine, despite experiencing health related, financial, or emotional consequences. Statistics for over the counter medicines sold in the UK over 2015 reached a total sale worth £2.55 billion. Painkillers accounted for 23.2% of the total sales. Followed by cough and cold remedies, accounting for 18.7% of sales. The sale of over the counter medicines have increased each year, with Doctors and clinical medical surgeries encouraging patients to seek pharmaceutical advice first from their local chemist. Painkillers and cough and cold remedies hold the most potential to be abused and to become addicted to. It is estimated that over 900,000 people in the UK could be abusing an over the counter codeine based medications. 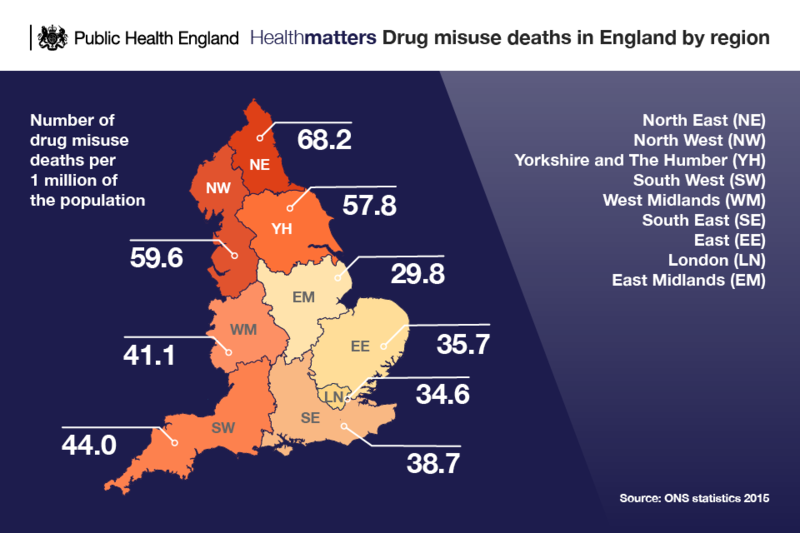 Statistics released by Public Health England, relating to UK drug misuse related deaths in 2016, show how prevalent a problem it is in the UK, as this includes over the counter medication abuse and opioids which cause the most deaths; usually in middle aged males. Inappropriate medical use: The individual is using the medication for purposes other than the medication is intended for, or ignoring the prescribed dosage. They may buy the medication to treat a genuine medical complaint, but take the medication for longer than recommended and/or abuse it. This is common with codeine based medications, which should not be used for longer than 3 days without consulting a Doctor. The medication is consumed in higher dosages to achieve a combined medical and euphoric effect. Physical dependence: Physical dependence occurs where an individual starts to take a certain over the counter medication for medicinal purposes, but continues to take it beyond the recommended length of time without consulting a Doctor. Dependency classically applies to codeine based analgesics, which can create a dependence in as little of 3 days of continuous use, even when taken as prescribed. The individual will continue to use the medication in order to avoid unpleasant withdrawal symptoms. Attempt to change body shape: This applies to individuals who are abusing over the counter weight loss aids and laxatives. Those who are not consulting a doctor, or confirmed as overweight can have a tendency to abuse these over the counter laxatives and weight loss aids; in particular those suffering from an eating disorder or Body Dysmorphic Disorder. Unintentional misuse: Unintentional misuse of an over the counter medication can occur when an individual is taking a particular medication, without consulting the pharmacist or reading the instructions first. They may have been given misinformation from a well-meaning friend or relative and are going on their advice rather than the advice of someone experienced in dispensing medicines or a medical practitioner. 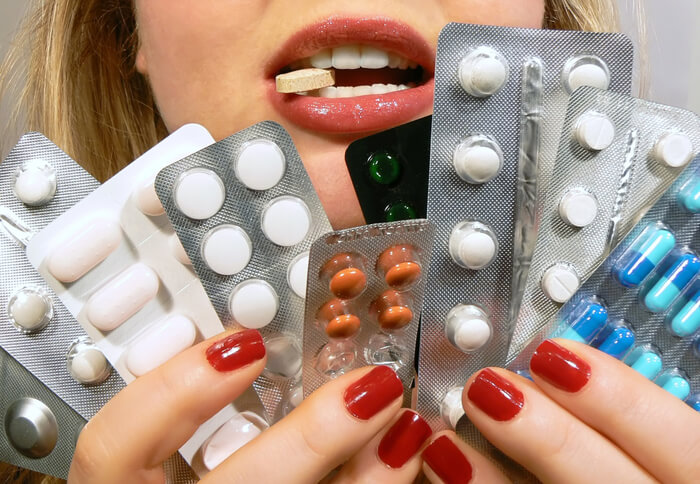 Deliberate abuse of medications: An individual who is deliberately abusing an over the counter medication is using the medication purely for its pleasurable effects. Codeine produces feelings of warmth, euphoria and drowsiness when abused in higher than the recommended dosage. Decongestants can produce a stimulant effect. Individuals that are deliberately abusing an over the counter medication, or not taking the medication for its intended medical purpose, but for the purpose of getting high have the potential to develop a dependency and full blown addiction. They may also mix the medication with other drugs or alcohol to gain more pronounced effects or different effects. 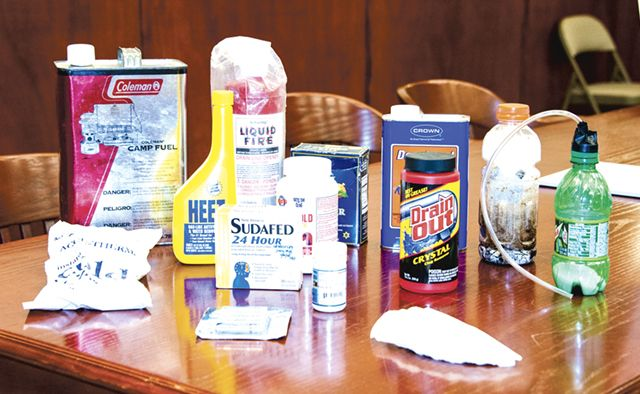 Facilitating the use of, or production of, illegal substances: Over the counter medicines be used to facilitate the use of, or in the production of illegal drugs. For instance certain medications can be used in the production of Crystal Meth or other synthetic illegal drugs. An illegal Drug user or addict may use citric or ascorbic acid to break down Heroin, Cocaine or Amphetamine into a liquid that can then be injected. They are not using the over the counter medicine for personal abuse but using it to facilitate the abuse of an illegal drug or to manufacture a synthetic illegal drug. Is your loved one having mood swings or being secretive? Have they lost interest in hobbies, friends and socialising? Have they lost interest in their appearance or hygiene? Are they behaving out of character? Do they frequently ask for money, or has money or items of worth gone missing? Have they become unusually unreliable or calling in sick/late for work? Are they neglecting responsibilities, family and children? Have they become isolated and withdrawn from loved ones? Have you found many empty packets or stashes of over the counter medications? Do they frequently visit chemists or pharmacies? Any marked change in an individual’s appearance or behaviour should not be ignored; it means that your loved one has a problem; quite possibly with over the counter medications. If you are still unsure, or need professional advice as how to help your loved one get the correct treatment, please call us and we will do all we can to help. Am I Addicted to Over-the-Counter Medications? You are suffering physical health, relationship, mental health problems, financial problems and career difficulties due to your over the counter medication use, but still cannot stop. The above signs indicate that you have an abuse problem or an addiction to over the counter medications. Addiction to any drug, legal or illegal can be life threatening, so we would urge you to call us or chat to us live online, so that we can help you break free for your addiction. Is There Free Treatment for Over-the-Counter Medicine Addiction? Free treatment for over the counter medication addiction can be accessed through two pathways; your GP can help you plan a reduction regime if you have a physical dependency, but it does mean you being completely honest with them in order for it to work. You can also access help and support through your local drug and alcohol team (DAT). You can find details of your local DAT team. DAT takes self-referrals and also referrals from other agencies, so you do not have to go through your GP. By engaging with your local DAT you will receive keyworker session and access to groups held within in the centre. They can also arrange for CBT counselling as can your GP. Addiction is an illness of the mind, so it is a must that the psychological aspect of abuse problem or addiction is addressed as well as any physical dependency. DAT treatment is very helpful for those that do not have a chronic addiction problem, but many addicts find it extremely difficult to get and stay clean in their local community, with temptation all around and easy access to chemists. Some individuals are required by law to attend DAT appointments if they have engaged in criminal activity; this means that those that really want to get clean will also be mixing with some individuals who don’t and who are only attending as part of their probation requirements. Are There Meetings for Those with Over-the-Counter Medicine Addiction? You or your loved one can access free local community support for an addiction to over the counter medications; there are 12 Step fellowships such as Narcotics Anonymous and Cocaine Anonymous who provide a recovery programme and support for anyone addicted to a mood and mind altering substance, including over the counter medications. There are also Smart group meetings available which focus of goal setting in achievable measures. Please click on the links to find out more about their meetings and to locate one near to you. The only way to access rehab for an over the counter medicine addiction is through self- funding for a private rehab. Addiction Helper work with only the best private addiction rehabs in the UK and Overseas. We work with over 100 CQC regulated treatment centres of the highest calibre. Finding the right addiction treatment centre without professional guidance can be like trying to find a needle in a haystack. We are here to ensure that you or your loved one access the best treatment possible and the treatment that is most likely to free you or your loved one from addiction to over the counter medicines on a permanent basis. At Addiction Helper, we are passionate about saving the lives of those afflicted by the life threatening disease of addiction, which presents in many forms and guises. Addiction affects the whole family, not just the addict; the whole family need support whilst their loved one recovers and we can help with this too. Families of addicts can receive support through our rehabs where their loved one is being treated and also here: Adfam and Famanon. The professional addiction rehabs that we work with only employ addiction professionals with impressive credentials and experience, including: Doctors, Nurses, Counsellors, Psychologists, and Holistic therapist and Support workers. Many of our staff have themselves previously overcome an addiction, so are therefore are in a unique position to have a great insight into the disease of addiction and how it affects the individual and their loved ones lives. They understand fully the nature of the disease, and combine their personal experience and qualifications to comprehensively treat the psychological aspect of over the counter medicine addiction in their patients. Holistic therapies, including Mindfulness, Meditation, Acupuncture, Fitness, Yoga, Tai Chi, Art therapy, Music therapy and much , much more! Furthermore, you or your loved one will also receive 1 year complimentary aftercare on completion of treatment. Aftercare is a vital part of the ongoing recovery process. It assists in the transition from inpatient rehab treatment to integration back into daily living, clean from over the counter medications. It also keeps the individual focused and motivated in their recovery and further cements the foundations of an addiction free life! 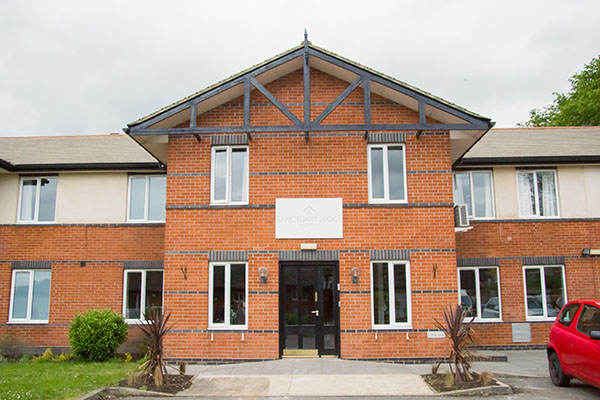 On admission to one of our CQC regulated rehab clinics, you will be comprehensively assessed by a qualified doctor, experienced in treating all manner of addictions and co-occurring illnesses, such as Anxiety, Depression, PTSD, Eating Disorders and OCD. They will also be experienced in treating Dual diagnosis clients; those that have a confirmed diagnosis of a mental health illnesses such as Borderline Personality Disorder and Bipolar Disorder. On completion of the medical assessment, the Doctor will prescribe a full medical detox regime for any dependency to over the counter medications that it would be dangerous to stop suddenly. A detox regime will also be prescribed for any additional dependencies presenting where a medically managed detox is required. They will also ensure that any other illnesses are comprehensively treated and consult with the Counsellors and rehab clinical team as to what needs to be addressed in the individual’s treatment plan. The duration of treatment recommended will depend on a number of factors, all of which will be taken into account. Addiction Helper carry out free over the phone telephone assessments, conducted by one of our highly trained and skilled addiction treatment experts. We will be able to recommend a suitable treatment programme and rehab that will meet all of your treatment needs. Our rehabs offer both short term and long term programmes, secondary and tertiary care also. We have a variety of addiction treatment rehabs from low cost affordable rehab to luxury rehab and everything in between. We will devise a treatment plan that will take into consideration the patient’s treatment needs first and foremost, the budget available, location and personal preferences. With one phone call to us you can take that first step to permanent freedom from over the counter medicine drug addiction. Call us now for further help and assistance! Recovery is possible with the correct professional help and treatment.